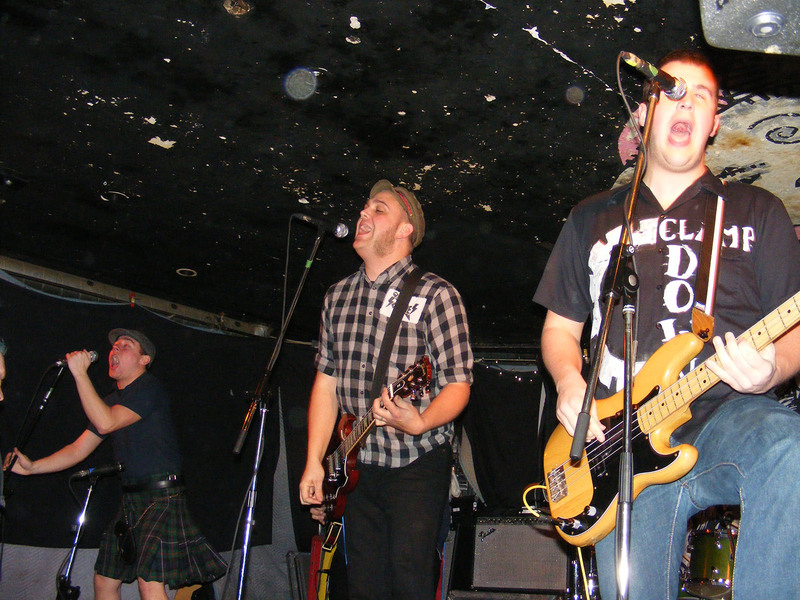 Celtic punk is the name of the game for Flatfoot 56. The biggest band in Christian music returned to play Sneaky Dee’s in Toronto once again. Biggest in the sense of physical size. The Bawinkle brothers, Tobin (lead vocals, guitar), Kyle (bass) and Justin (drums), range in height from 6’5″ to 6’10”. The band is rounded out by Eric McMahon (bagpipes/guitar) and Brandon Good (mandolin/guitar). All of the band members also share background vocals. Rollicking vocals, guitars, mandolin, bagpipes and drums, all at full volume, all at a blistering punk song pace. Life can’t get any better than hearing this. This is the fourth time I’ve had the opportunity to see this band perform and once again they didn’t disappoint. Flatfoot 56 has been rated as one of the top bands to see live. The insanity this band creates spills from the stage to the rear of the audience. Only the fit and well padded will dare to venture into the mosh pit. The band encourage circle pits and the result is a mosh pit of death that few can escape unscathed. With a large crowd in attendance, I didn’t dare to work my way through the mosh pit up to the stage. I knew I would be pummelled. Flatfoot 56 is one of the few bands I know who hits the stage without a prepared set list. Immediately prior to going on, the band members were discussing what they should play and who would take which duties. Rather than creating chaos, it gives the band a spontaneity and vibrancy that so many bands and musicians lack. Songs covered all of the favourites from their last two albums, Jungle of the Midwest Sea and 2010’s Black Thorn. The band returns to the studio early in the new year to their next album. I would have liked for them to have played more of their old tracks from Knuckles Up, and Waves of War, but how many songs can you play in a 40 minute set? The band does have a few constants. Encouraging audience participation in activities they dream up, socializing before and after concerts with fans, and playing “Amazing Grace” as their finale. Preceding “Amazing Grace”, Flatfoot 56 also offered up another old time hymn favourite, “I’ll Fly Away”. I’m hoping that this track will be included in their upcoming CD, but you don’t have to wait, it’s available as a free download by clicking here. Don’t forget to check this band out live. Flatfoot 56 returns to Toronto early next spring. Keep track of their tour dates on the website by clicking here.